New Delhi: In a landmark move, the Law Commission on Tuesday recommended to the Narendra Modi government to make marriage registration compulsory within 30 days of the wedding ceremony with no exemption to any religious community including Muslims. Consequently, It could soon become impossible to have a hush-hush marriage. The panel, which advise the government on complex legal issues, suggested punishing the defaulters with a fine of Rs 5 per day for unreasonable delay. The panel also suggested other penalties for providing false information and for refusal to furnish certain information, such as name and address. "Since Independence, numerous initiatives have been taken to address the issue of gender inequality. Instances of marriage fraud have also come to light in recent times," the panel headed by Justice BS Chauhan observed in the report. "In the absence of compulsory registration, women are duped into marrying without performance of the conditions of a valid marriage. This deprives women of societal recognition and legal security. Such fraudulent marriages are especially on rise among non-resident Indians. Compulsory registration can serve as a means to ensure that conditions of a valid marriage have been performed." The law ministry on February 16 asked the commission to examine and submit a report with regard to various issues relating to compulsory registration of marriages. Prominent Muslim organisations and clerics led by the All India Muslim Personal Law Board have always dubbed attempts to make marriage registration mandatory as "direct infringement with Sharia law". "How can you render a nikah invalid simply because the marriage has not been formally registered with the concerned authorities? No one other than a Sharia court has the right to declare a nikah invalid," AIMPLB sources said. Once it becomes law, the couples who fail to register their marriage will be devoid of facilities that require a marriage certificate. Experts say compulsory registration would help curb instances of bigamy and regulate polygamy. "It will become important to show the consent of first wife to register second marriage where polygamy is permitted for a faith or tribe. This will help ensure social and legal protection to women who are socially vulnerable," law panel sources said. The report also comes at a time when Uttar Pradesh's Yogi Adityanath government's decision to make marriage registration compulsory without exemptions to Muslims had triggered a controversy. According to experts, compulsory registration of marriages in the country will help in dealing with many serious social and legal problems in the country. It will be helpful in preventing child marriage and would ensure that the minimum age of marriage is complied with. Also, such a law will prevent non-consensual marriages in the country, will check illegal marriage or polygamy and among other things would enable married women to claim their right to live in the matrimonial home, claim maintenance etc. and therefore will be a step in direction of empowerment of women. "Registration of a marriage under any of the prevailing marriage Acts like the Indian Christian Marriages Act. 1872, the Kazis Act, 1880, the Anand Marriage Act, 1909, the Parsi Marriage and Divorce Act, 1936, the Sharia Application Act, 1937, Special Marriage Act, 1954, Hindu Marriage Act, 1955, any other custom or personal law relating to marriage will be acceptable and a separate standalone legislation may not be required so long as an amendment is made to the Births and Deaths Registration Act to include marriages," said the law panel's report. It says the registrar responsible for the registration of births and deaths will also be responsible for marriage registrations. "The Amendment Bill should provide that if the birth or marriage or death is not registered within the time limit, the registrar shall on the payment of a late fee, register the death or birth within 30 days," the report said. "It can be registered within one year only with the written permission of the prescribed authority; and after one year, only on an order of a First Class Magistrate. There will also be a penalty of `5 per day in case of delay in registration of 'marriage without a reasonable cause'." 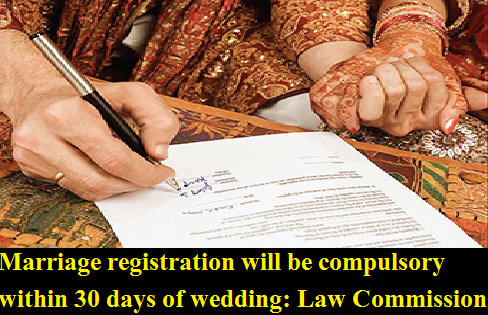 Marriage registration compulsory within 30 days of wedding: Law Commission, The panel, which advise the government on complex legal issues, suggested punishing the defaulters with a fine of Rs 5 per day for unreasonable delay. The panel also suggested other penalties for providing false information and for refusal to furnish certain information, such as name and address.